Police say 62-year-old Richard Henry Bain is the suspected gunman behind a deadly shooting at the victory party of Quebec’s newly-elected Premier, Pauline Marois. The shooting left one man dead and another person in critical condition. 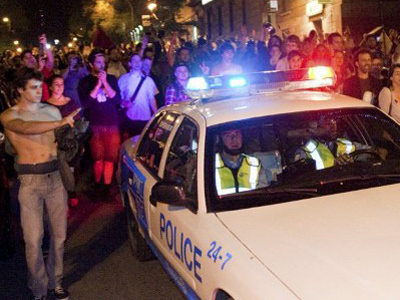 A third person was treated for shock after the Wednesday shooting, Montreal police told Canadian media. According to the Montreal Journal, Bain is the owner of a hunting and fishing shop in La Conception, Quebec. As he was dragged to a police cruiser, Bain shouted, “the English are waking up” in French with a Canadian-English accent before adding in English that there would be "payback." Bain, who was armed an assault rifle and a handgun, started a fire behind the downtown Montreal venue where Marois’ supporters had gathered, Reuters reports. Video has emerged, showing Bain in a blue bathrobe and black balaclava with a gun on the ground surrounded by police. The footage also showed Bain's high-powered assault rifle. Marois heads the separatist Parti Quebecois, which seeks independence for the French-speaking province of Quebec. The premier-elect returned to the stage a few minutes after she left it, urging her supporters who packed the hall to leave calmly, stating that "there was a little unfortunate incident," so as not to create panic. Everyone was evacuated and police are investigating. "We don't know what was [behind] that event," police spokesperson Dany Richer told CBC. "Our investigators are going to meet with [the detained] overnight." 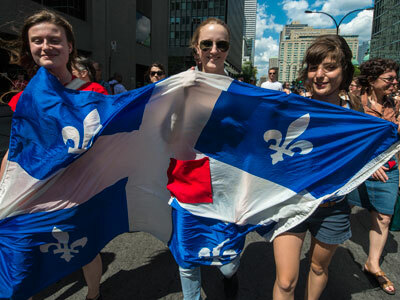 This event comes as the separatist Parti Quebecois (PQ) won Quebec’s provincial elections and will form a new government there, once again raising the possibility of a referendum on independence being held in Canada’s French-speaking province. According to the latest results, PQ has won or was leading in 57 ridings in Tuesday’s election, just shy of the 63 needed for a majority in the 125-seat legislature. The party’s leader Pauline Marois, 63, will replace the head of the Liberal party, Jean Charest, and will become the province's first female premier. 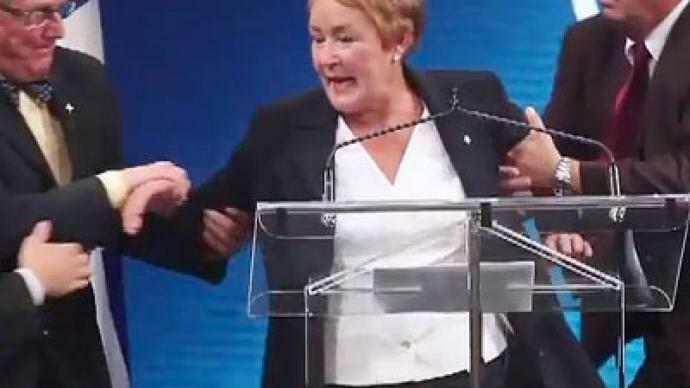 Just before the shooting incident took place Marois took the stage for her acceptance speech telling her supporters that she hopes to put aside all the difference for a united Quebec. "Voters have made a choice and we will respect it, and we will govern with all other parties at the national assembly," she said. 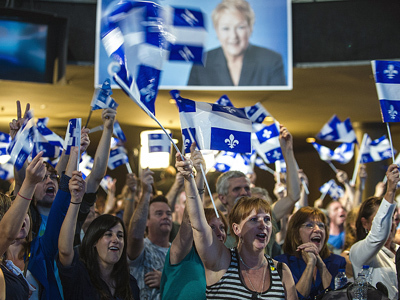 PQ’s win is a significant loss for the Liberals, who governed the province for almost a decade. Jean Charest miscalculated the mood of the electorate, believing voters would support the Liberals for a fourth term. He ended up losing his own riding of Sherbrooke to a PQ candidate. "This is not the result I would have wanted. This is not a battle that I backed away from. I now have the firm conviction that our party will continue to serve Quebec, and will do it together," Charest told his supporters. Independent journalist Robert Harneis told RT that the shooting in the Metropolis concert hall will not affect PQ’s policies in the future. “The difficulty of course is that you have English-speaking Canadians on both sides of Quebec, like in Nova Scotia for example, and they are definitely not interested in a French autonomous Quebec,” he added.